Do you love to try new flavours and recipes? I’m willing to try just about anything at least once. Because of my open-mind attitude, I’ve discovered several new recipes that have become family favourites. RawSpiceBar, a monthly spice subscription box, is perfect for me and I’m looking forward to trying out my first box at the beginning of January. 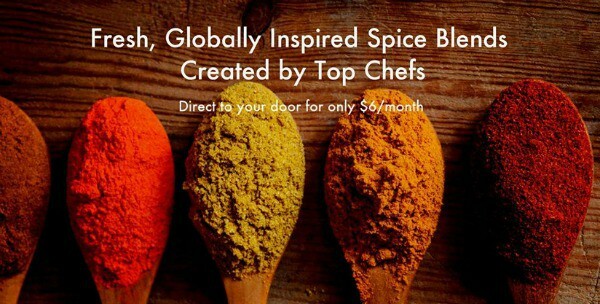 RawSpiceBar works with top chefs around the world to curate the best freshly ground spice blends for their subscribers to try. Each month subscribers are sent a box of three to four freshly ground spice blends from one region of the world. It includes enough spices to create three dishes serving 8 to 12 people. Also included are three recipe cards using the spices and info to access additional recipes online. I like that they also include information about the spices – origin, history and tasting notes. Plus, they’ll often throw in surprises like bonus spices, toasting tips, discounts and more. It’s an excellent way to be introduced to new spices that aren’t mainstream in your local area and learn how to utilize them in your cooking. A subscription to RawSpiceBar makes a thoughtful and unique gift to a foodie on holiday shopping list. You’ll receive a personal certificate for gifting. With free shipping to the USA & just $0.65 for shipping to Canada and a low monthly price of $6, a RawSpiceBar subscription is excellent value and something you can look forward to receiving at the first of each month. Do you know anyone who would love a subscription to RawSpiceBar? I do – me! Connect with RawSpiceBar on Facebook, Twitter and Google+. I like that the spices are freshly ground — usually with 7 to 10 days of shipping! I learned that they are Pan roasted for maximum flavor. I really like that the subscription is only $6 a month! I learned they cost just $6 a month to be delivered to your door! I love that the spices will only be about 7-10 days past their ground date when you get them. I like that the spice blends are freshly ground-received within 7-10 days of grinding. I learned you can do a one month, six month or a year subscription. We are spice fanatics. Will definitely be subscribing. Every month you get 3-4 freshly ground spice blends from one geography or region, enough to create 3 dishes serving 8-12 people and three kitchen-tested recipe cards. That I don’t have to go to the store to buy my spices. I like that they come in small batches to stay fresh! I like their quality and variety each month with prompt home delivery.